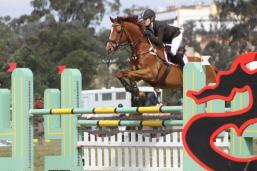 Julia found Jay for Suzannah Willis in June 09, with a view to getting her out and competitive in the bigger Junior classes. They had their first outing at the beginning of July when they competed in the Juniors at Gunnedah Showjumping Festival. The plan obviously worked, with the pair winning the Junior Grand Prix on the final day. They went on to place 2nd in the Juniors at the NSW State Championships, and then to win the Maiden D Grade at Showjumping over the Mountains. And the form continues to improve, with another win at the Youth Championships in )ctober 2010, as well as numerous placings along the way.